OXFORD, Miss. 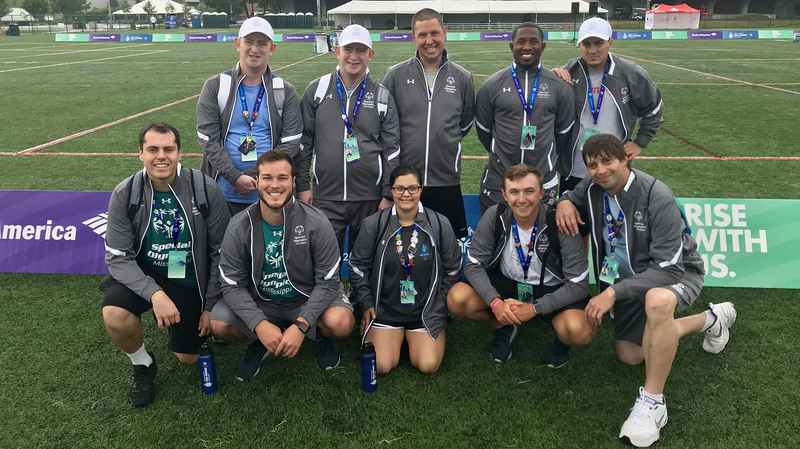 – A team from the University of Mississippi is in Seattle to participate in the 2018 Special Olympics USA Games. The event, which takes place from July 1-6, highlights the abilities of athletes with intellectual disabilities while promoting ideals of acceptance and inclusion. Amanda Alpert, assistant director of intramural sports and sports clubs for the Department of Campus Recreation, attended Central Michigan University, where she helped create Unified Intramural Sports. These leagues allow those with and without intellectual disabilities to compete together in a sport. “When I came to Ole Miss in 2014 I wanted to bring Unified Sports to our campus and community,” Alpert said. Ole Miss participated in its first Unified Egg Bowl against Mississippi State in 2015, and Alpert has added other unified sports leagues, including soccer and basketball. “Unified Sports have been an amazing experience for me ever since I participated in them as a student,” she said. Besides the leagues, Alpert helped create Special Olympics College at Ole Miss, which is a registered student organization. The sport club hosts rivalry competitions and tournaments throughout the year. “The connections you form with the athletes and their families has been the most rewarding part of it all,” Alpert said. “I love providing athletes with the opportunity to play sports with our college students and also give our students opportunities to interact and compete with the athletes. This year, the UM team was given the opportunity to compete in the first Unified Intercollegiate Division at the Special Olympic USA Games. 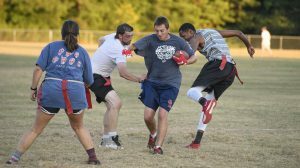 Ole Miss students competing on the Unified Flag Football team include Trey Skocy, a junior communication sciences and disorders major from Mattoon, Illinois; Josh Obregon, a senior accounting major from Columbia, Illinois; Marcus Thornton, a May 2018 graduate in elementary education from Shannon; and Dalton Sheffield, a senior biochemistry major from Henderson, Tennessee. The Special Olympics athletes who will be competing on the Unified Flag Football team are Daniel Arata from Desoto County, Madison Dennis from Tupelo, Luke Robinson from Pelahachie, Ben Rogers from Jackson and Bill Holden from Oxford. Alpert and former UM student Mary Evelyn Webb are coaching the team. Webb, who was a founding member and past president of SO College, said her involvement in unified sports has been one of the outstanding experiences of her life. “I have formed some incredible friendships with partners, parents and Special Olympic athletes,” Webb said. “While I’m excited for the competition and the flag football part, I’m most excited to be with these athletes as they fly for the first time, see the needle or make friends with people from all over the country. “It’s just a week when everything is all about them, and they certainly deserve it. Webb said the team has worked hard, and she’s excited about the opportunity. Skocy, who is serving as Special Olympics College president, said his involvement is about much more than sports. Skocy is most looking forward to seeing the many volunteers and fans coming to support the athletes who have put in hard work leading up to the event. “I believe this week in Seattle will be a life-changing experience, and I’m so happy I’m doing it with my best friends from SO College,” he said. The opening ceremony for the games aired live Sunday afternoon (July 1) on ABC. The flag football team competed Monday (July 2) against North Carolina and Alabama and will go against against Arizona and North Dakota Tuesday (July 3). The single elimination playoff tournament begins Wednesday (July 4). For more information, visit https://www.specialolympicsusagames.org/.